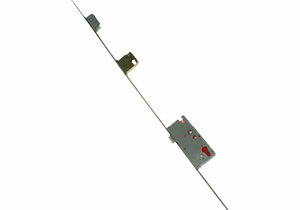 Mortice locks, in addition to the surface locks, are among the most common door closure. 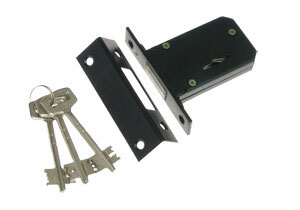 It can be said, that currently each doors are equipped with this type of lock, while surface locks are using as a additional protection, particularly in external door. Locks span – size A, the distance between the axis of the handle, and the axis of the key (or insert, WC handle), the most common spans in Poland are 60 mm, 72 mm, 90 mm, in Germany popular is 90 mm span – in Poland found in imported doors and locks. We recommend the use of 72 mm locks, because it seems that the elongated handle with wheelbarrow looks most proportionally. Distance from the face of the lock to the axis of the handle - size B, the most common span is 50 mm or 60 mm. In narrow locks used in PCV and aluminium joinery this amount is 25 mm or 35 mm. Savings locks- lock equipped only with ratchet, which is opened by handle. Because of lack of closing ratchet by a key or insert door can not be closed by a lock This type of locks are used in inside doors without necessity of key locking. Valve lock – lock equipped with valve operated by handle and ratchet locking by a key. Ratchet locking mechanism and key come as a set with lock and they’re selling jointly. 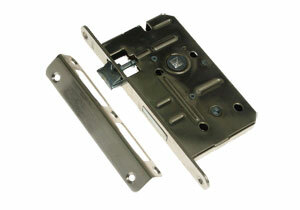 These locks are used as a interior locks, in rooms that do not require higher protection. 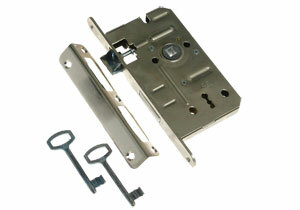 Lock with insert (cylinder lock) – this lock require cylinder insert for proper operation. Advantage of this solution is easy possibility of exchanging key by exchanging the insert itself. Room protection is much better, If used can be any insert from very wide range, also certified. Opening up even the simplest of inserts without the key is quite difficult. In addition, cylinder insert keys can open Master key system, several locks can be fitted with inserts opened for the use of the same key etc. This locks are usually selling without cylinder insert, is have to be bought separately (we offer very wide range of cylinder inserts, different lengths and safety classes, inserts can make master key systems). Without-key lock (WC) – ratchet of this lock is closed by a handle-blockade. This locks are used only in bathrooms. Multi-point locks are the modern way of crimp the door. 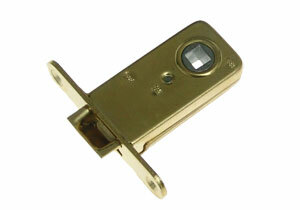 This locks are used in front doors or another, from which we require increased resistance to burglary. The lock complex consisting of one or two locks and additional hooks performs the functions of mortise lock and can replace the surface lock. This is a very wide range of locks for use in PVC and aluminum joinery. Locks are adapted to the appropriate profiles of PVC and aluminum. Locks of this type differ considerably in the closing mechanism, corps dimensions, shape of the front lock etc. We offer a very wide range of locks for PVC and aluminum. This type of locks are used in steel doors, there are several variations of this type of locks. lever (with lever / without lever) lever it is a opening pawl mechanism (normally opened by handle) by turning the key in the opposite direction to close. Currently most of the locks are equipped in levers, however, in particular, when we want to use knob in door we have to check, If lock has the lever, because without the lever it won’t be possible to open the closed but unlocked doors. Color and cover of the lock - Here are critical aesthetic considerations, you must choose the color of the lock and the striker to best harmonize with the color of the door and the frame. 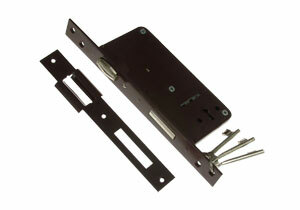 Available are painted locks (colors: brown, white, black), galvanized, and also with brass front. Locks differ in the way the covering, may be present as: painted /white, brown, black/, galvanized, brass. We offer also corrosion resistance, locks with brass elements, for use in watercraft and stainless steel locks. For production companies, we offer the locks in bulk without packaging, also without braces and screws - special prices.